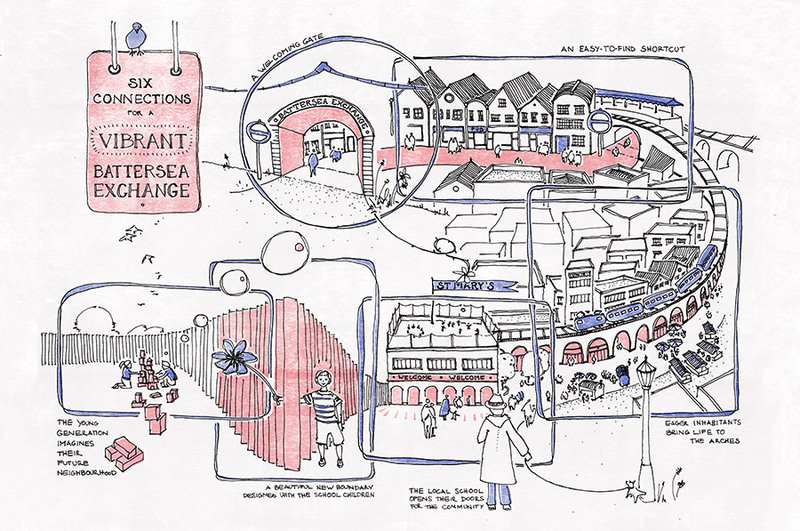 Our work has sought to put culture at the heart of a new mixed-used neighbourhood in Battersea. 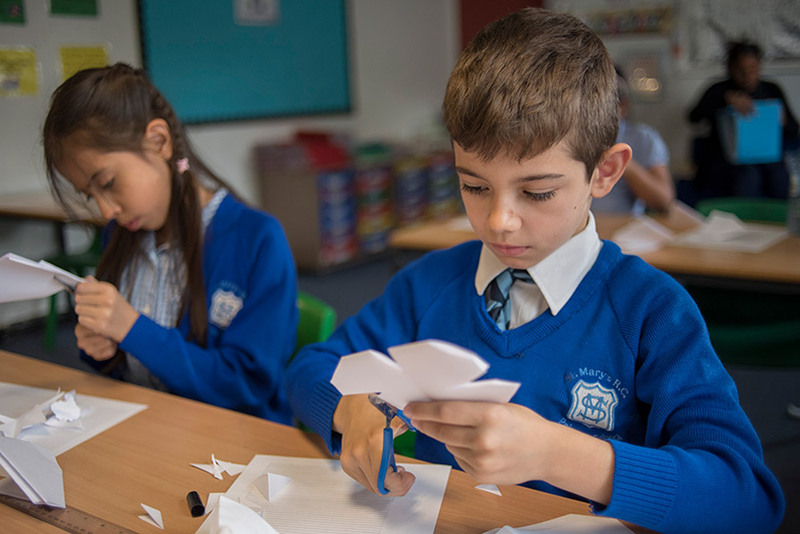 Centred on the rebuilding and enlargement of St Mary’s primary school, Battersea Exchange will provide new homes and commercial space on a former brownfield site. 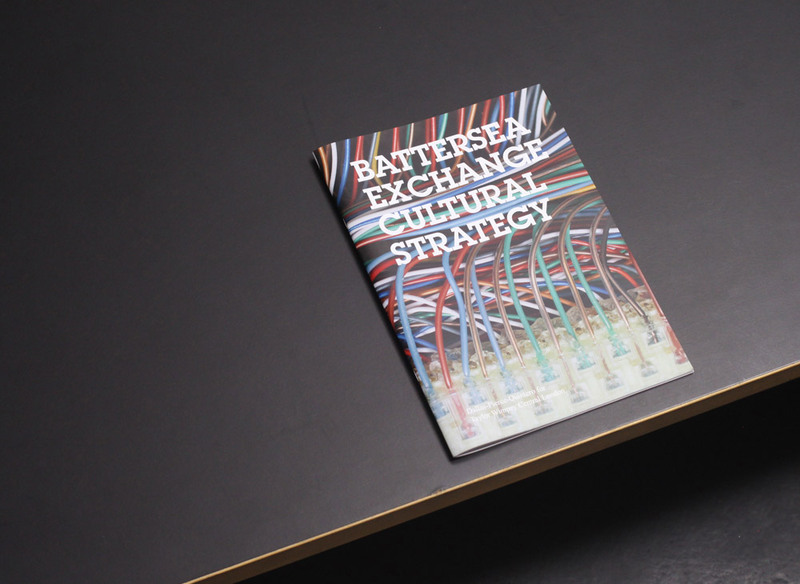 We developed a cultural strategy for the neigbourhood based around a series of connections to embed culture within Battersea Exchange. 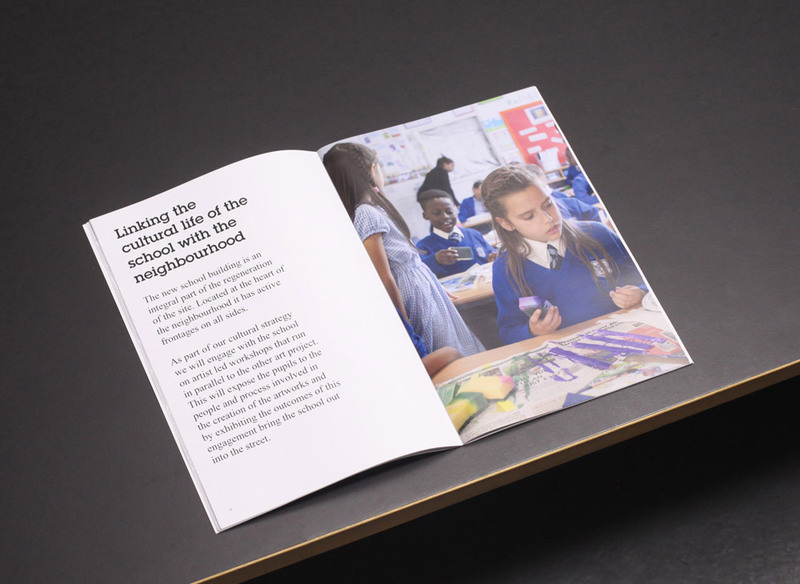 The strategy formed part of the planning conditions for the development and has helped steer Taylor Wimpey Central London’s engagement with St Mary’s school. Battersea Exchange is located at the western edge of the Nine Elms regeneration area. 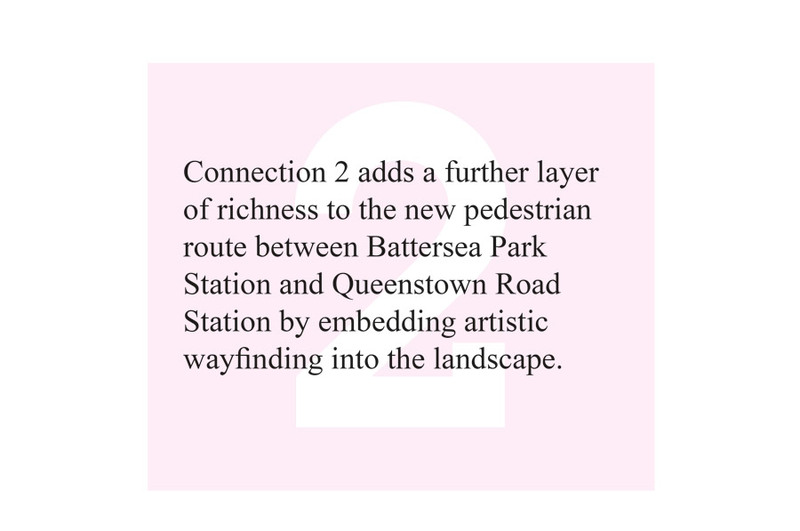 This part of Battersea already benefits from a cluster of cultural industries and arts organisations including; the Royal College of Art, The Pump House gallery in Battersea Park and the National Trust’s 575 Wandsworth Road. 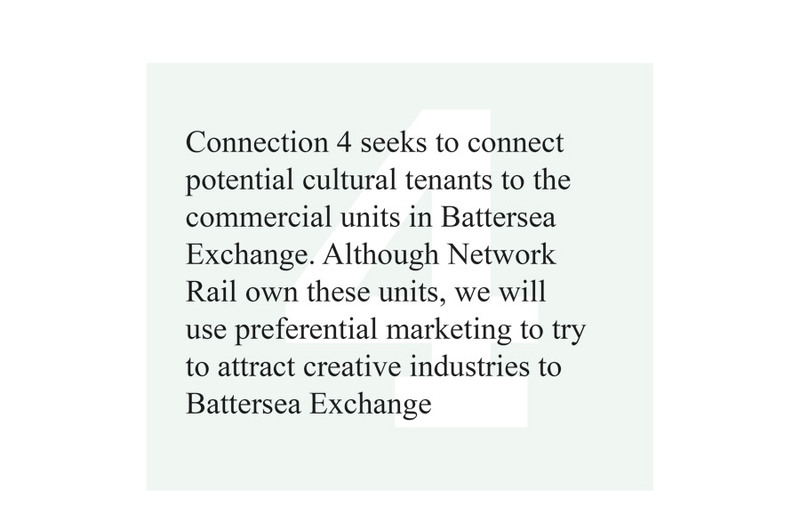 By establishing a unique cultural identity for Battersea Exchange we will add to the cultural mix of Nine Elms on the Southbank. 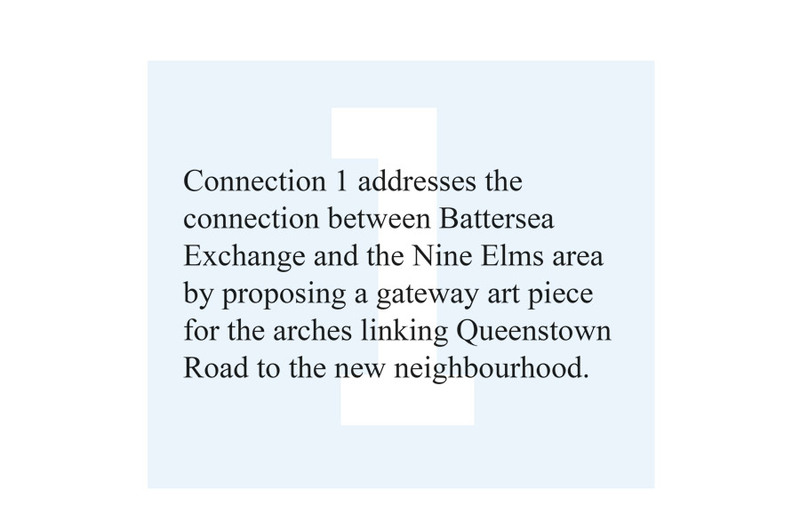 This in turn will help provide new opportunities for those living, learning, working or relaxing in Battersea Exchange. 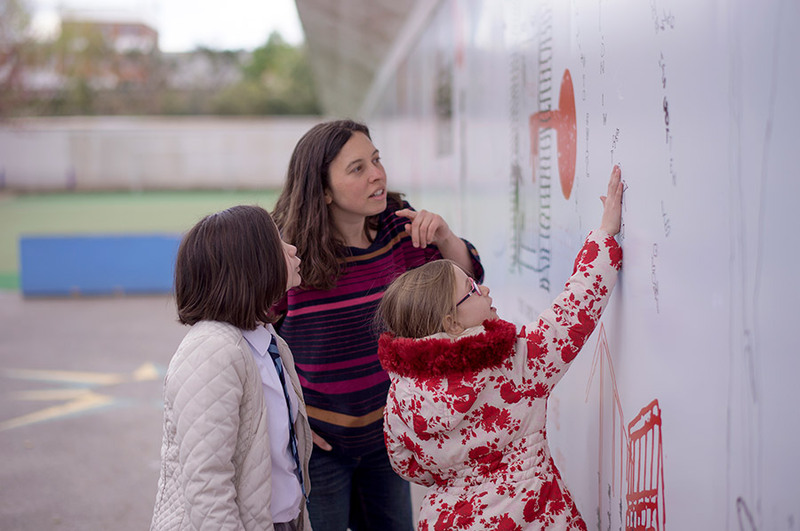 Underpinning the cultural strategy is the aspiration to connect the new development with its wider context and the people who live and work in it. 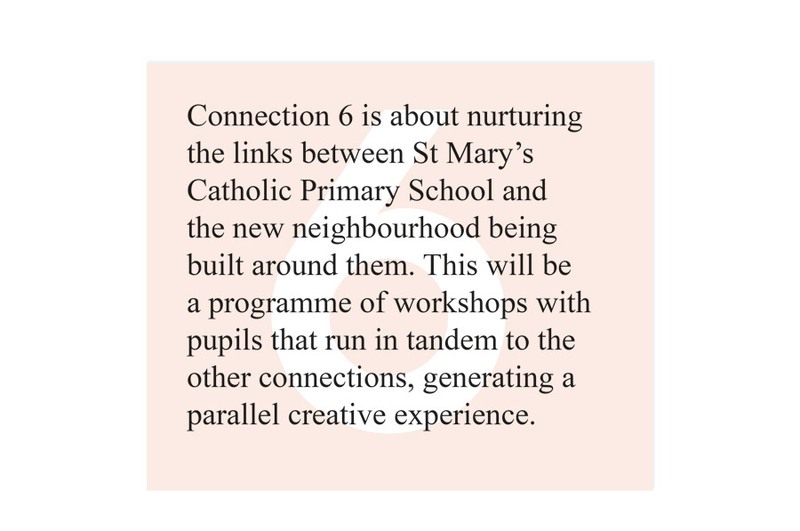 Within our research we identified seven connections that the Cultural Strategy develops in order to create a vibrant neighbourhood. Our role has been to create an overall cultural vision by building on the architect and landscape architects’ proposals, aligning with the local authority’s priorities and understanding the client’s aspirations. 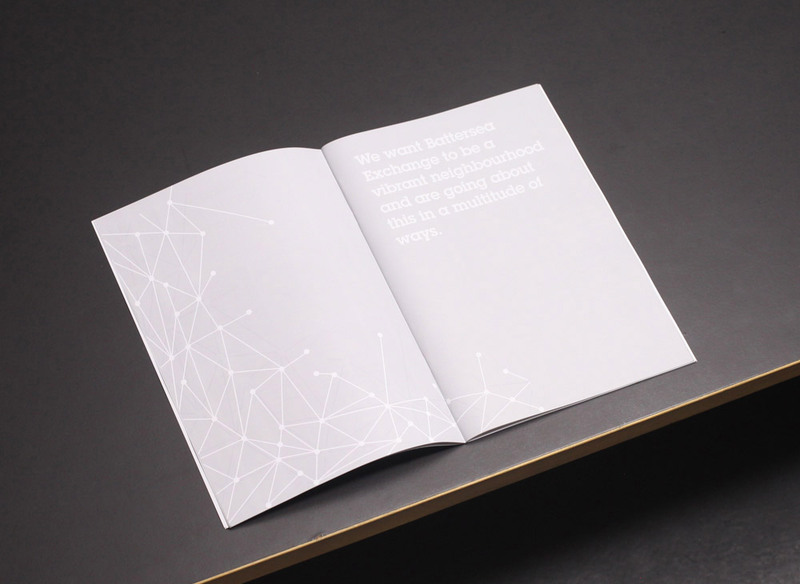 The creation of the strategy was therefore extremely collaborative, working with Enable (the Wandsworth Arts Team), Feilden Clegg Bradley Studios, Planit IE and Taylor Wimpey Central London. 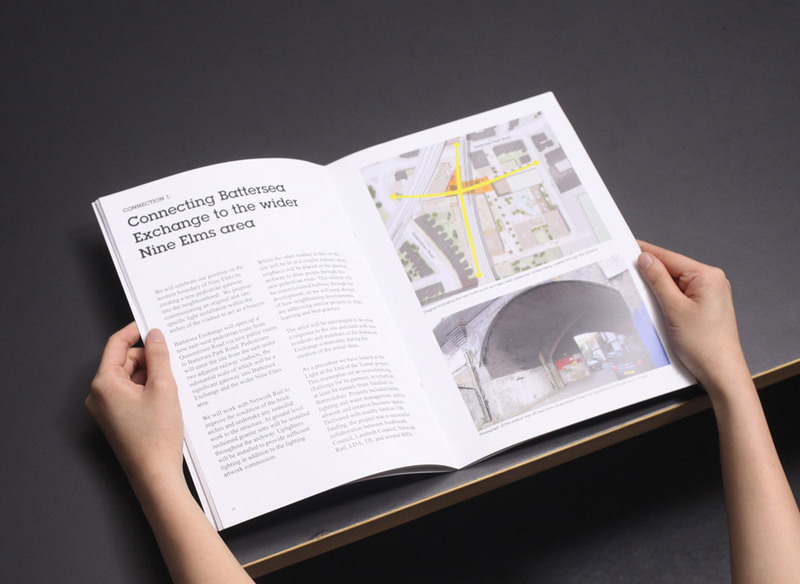 We continued this collaborative approach into the implementation stages by engaging with other developers and the wider Nine Elms team to share learning and ensure joined-up thinking across the area. 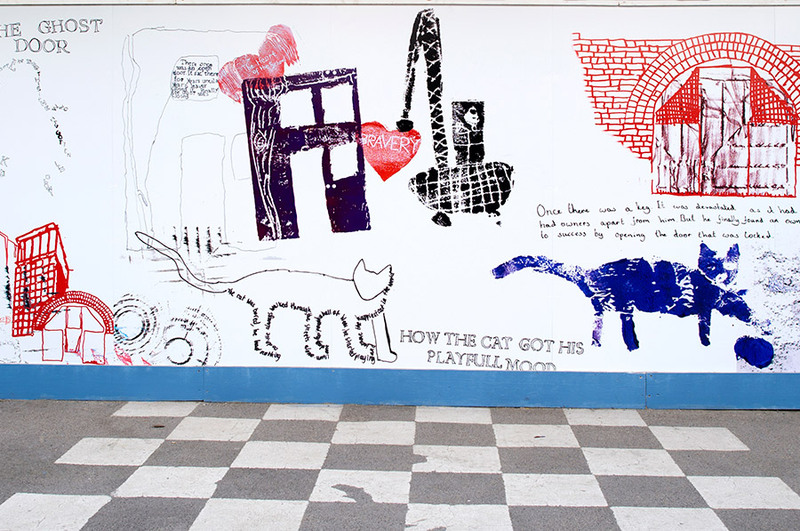 The first project has already been realized, this was a temporary commission to adorn the hoarding of the new development. 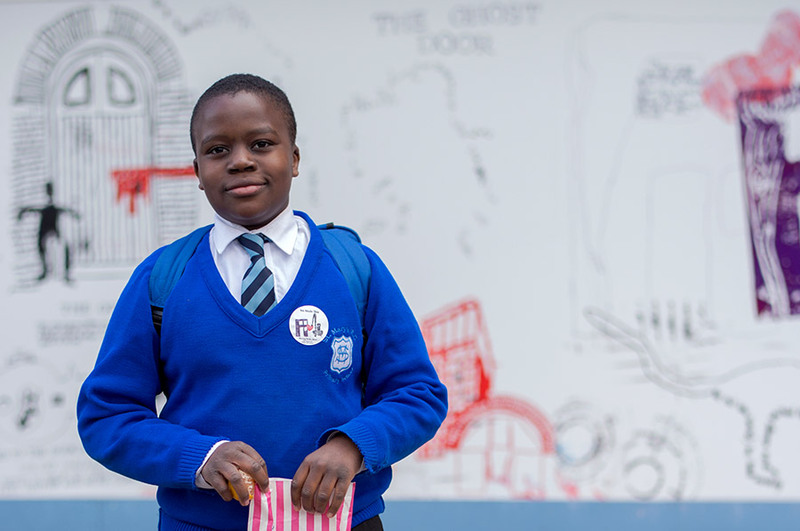 We commissioned artist Artist Orly Orbach who worked with every pupil in St Mary’s RC School to create a colourful hoarding display. 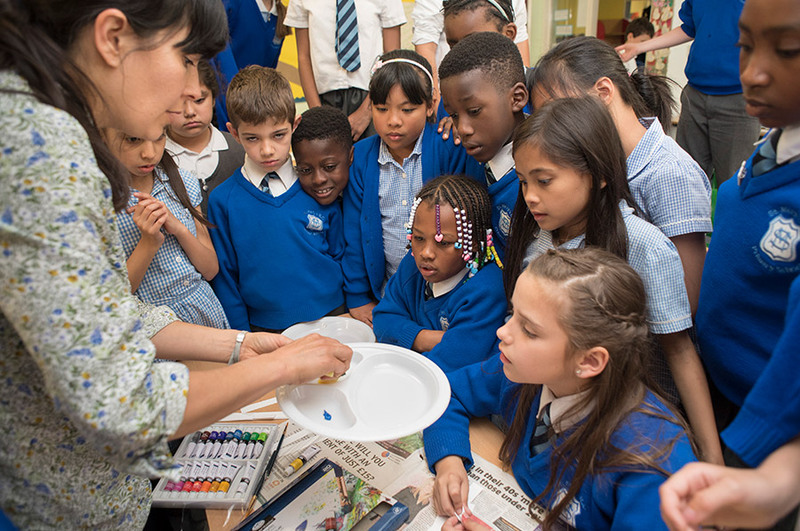 Through a series of workshops using a variety of printing techniques, Orly and the students created narratives, prints and drawings that document and reflect on changes in nature, the built environment and their school lives. 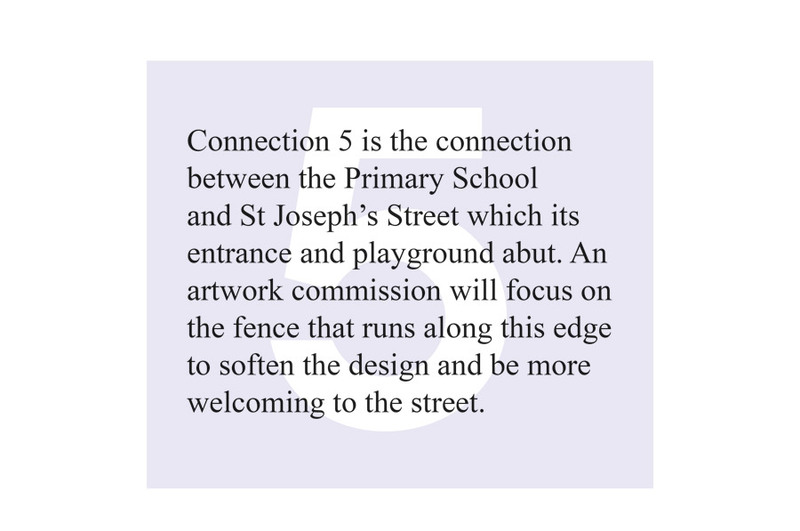 The second commission will soften the boundary between the St Mary’s Catholic Primary School and the street, re-imaging the proposed fence to create a more playful and welcoming facade. 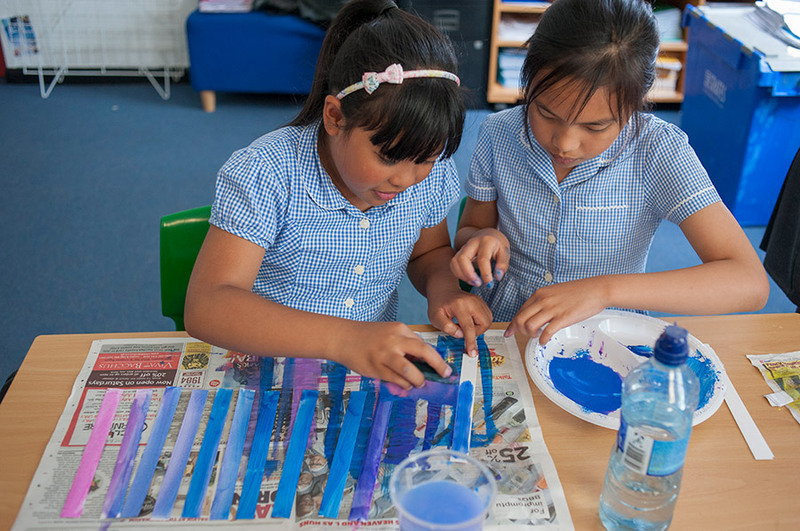 We have been working with a class of 10 & 11year olds over 8 workshops to develop the concept and design of the fence. 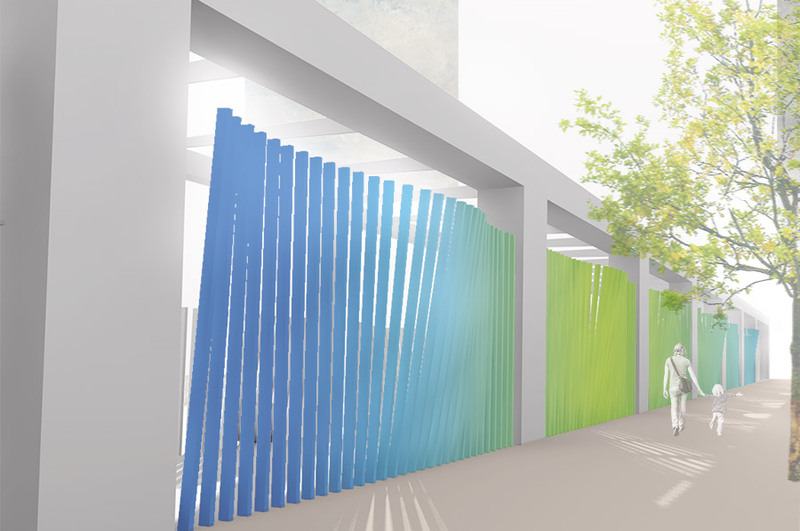 The resulting proposal is a sculptural wave, which varies in colour from blue to light green, referencing the school colours and new planting proposed on Gladstone terrace. We have also been working closely with the delivery team to translate the designs into reality within the overall project and construction programme. 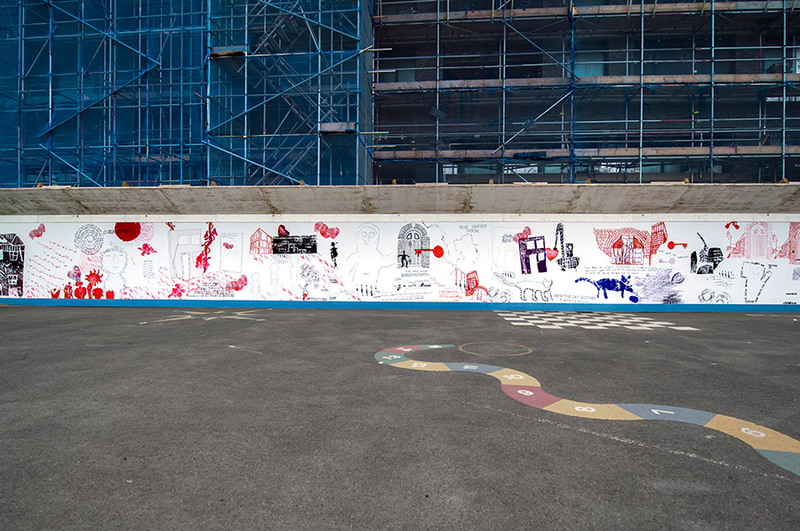 The fence between St Mary’s Catholic Primary School’s playground and Gladstone Terrace will be installed in the second phase of the school’s development and will launch with an exhibition of the children’s artwork produced over the 8 workshops.